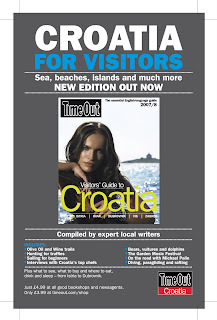 Expect to see the new issue of Time Out's Visitors Guide to Croatia in your favourite newsagent any day now. It's officially out and Portal Trogir (www.portal-trogir.com), on Trogir Riva, are the first to stock it. 50 pages bigger than last year, and full of inside information, it's a snip at £5 a copy. Apart from being able to organise all your holiday needs - accomodation, travel, boat trips and other excursions - Portal have just fitted out their offices on the Riva with the latest in internet facilities so you can catch up on your emails there too. I opened a blog with topic on adriatic-ionian problems. I write about relationships between eastern italian counties, eastern europe and, expecially, balkans. I hope u will enjoy. Thanks for your comment Piesal. Your site looks very interesting but unfortunately my Italian is not good enough to make the most of it.